Knots and how to use them! A knot not knotted neatly is a knot not knotted! Not all “knots” are true knots. 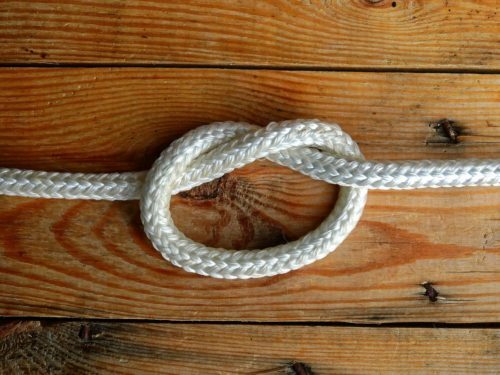 Technically, a true knot does not need to be tied around anything; it can hold its form on its own without another object such as a post, eye-bolt, or another rope to give it structure. A hitch, by contrast, must be tied around something to hold together; remove the thing it’s tied to, and a hitch falls apart. A bend is a knot used to join two rope ends. In practice, we often use “knot” as an umbrella term to cover all these types, but the distinction is useful to know. Make a two bights next to each other in opposite directions at the end of a rope. Make the bights approximately the desired size of the finished knot. Leave plenty of rope for the working end to make the wraps needed next. Pass the working end through the top bight and wrap around both strands of that bight only. Continue making wraps but now encircle all three strands working down the ropes. Pass the working end through the opening of the bottom bight to finish theknot. Tighten the knot by first pulling up on the top loop, then pull down on the standing line. The Reef Knot or Square Knot is quick and easy to tie; it is a good knot for securing non-critical items. 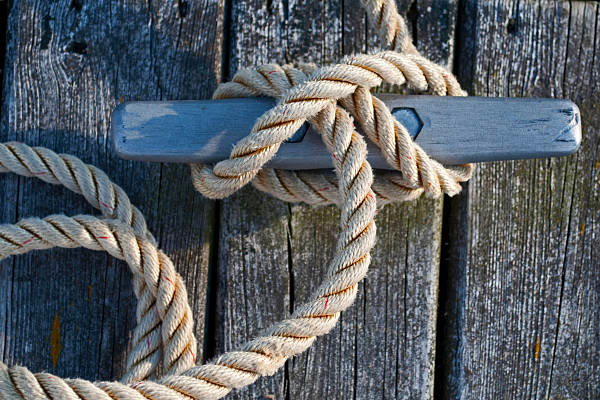 This knot was used for centuries by sailors for reefing sails, hence the name Reef Knot, and tying things aboard ship. It is important that this knot should not be used as a bend (for tying two ropes together) and it can be unsafe and come apart. 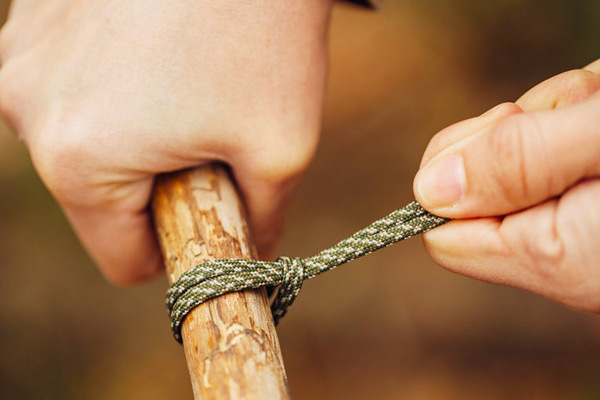 Be sure to form the square knot and avoid tying a granny knot, by making sure that both parts of the rope, the standing line and the free end, exit the knot together. Take two ropes and cross them (red over blue) to form a half knot. Cross them a second time (red over blue again) and pull the ends tight to form the knot. The sheet bend (also known as becket bend, weaver’s knot and weaver’s hitch) is a bend, that is, a knot that joins two ropes together. Doubled, it is effective in binding lines of different diameter or rigidity securely together, although it has a tendency to work loose when not under load. ‘The truckies knot or trucker’s hitch is a compound knot commonly used for securing loads on trucks or trailers. Using loops and turns in the rope itself to form a crude block and tackle, it has long been used to tension lines. Origin: The Beer Knot was introduced in the late 1980’s by an Austrian, Peter Ludwig, at a National Speleological Society Convention. It has been extensively tested. Tying it: Many writers describe difficulty tying the Beer Knot. The Pusher Rod shown in the animation provides an excellent answer. Wire from a coat hanger was used. One end was tightly twisted into a loop and the end was cut obliquely as shown in the insert of frame 4. The design allows the end to be easily hooked into one layer of the strapping whilst avoiding exiting the second layer to catch on the outer tube. Length: For one inch (2.5 cm) tubular webbing, a twelve-inch (25 cm) overlap is recommended. This provides about three inches (7.5 cm) of overlap each side of the finished knot. To save space, the animation employed a shorter overlap. Strength: The one inch tubular nylon webbing used in the animation has a nominal breaking strain of 4,000 lb. Because the load is distributed to both sides of the finished loop, the nominal breaking strain of the loop should be 8,000 lb. However, the Knot weakens the strap to about 80% – indicating a breaking strain around 6,400 lb. The 15:1 safety ratio applicable for critical loads would indicate a safe working load up to 400 lb. Precautions: Once set by a major load, the Beer Knot enjoys an excellent reputation for reliability. Many writers say that it does not appear to slip. Nevertheless, it is wise to check both ends of the knot: one tail end is visible; the other is easily felt. Alternatives: Webbing straps may also be joined using a Water knot. However, the water knot markedly weakens the strap and may reduce the nominal breaking strain to about half. 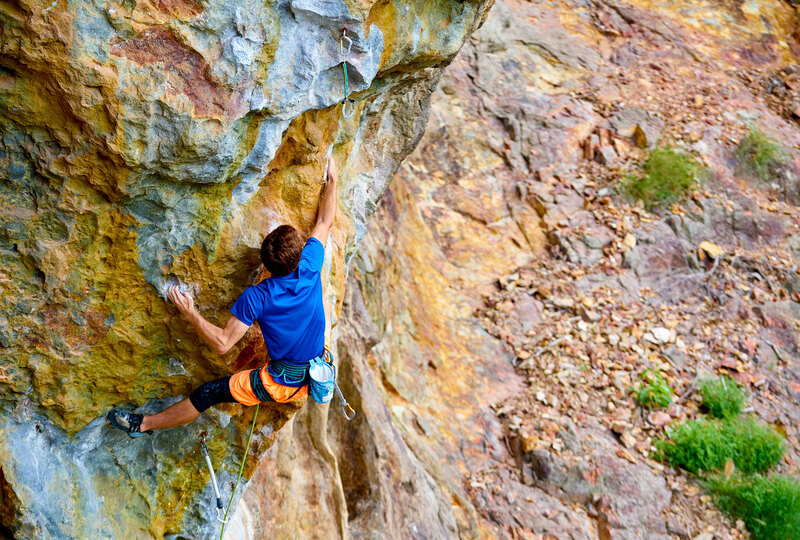 The Water Knot (also known as the tape knot, ring bend, grass knot, or overhand follow-through) is a knot frequently used in climbing for joining two ends of webbing together, for instance when making a sling. It is tied by forming an overhand knot in one end and then following it with the other end, feeding in the opposite direction. The ends should be left at least 7.5 centimetres (3.0 in) long and the knot should be “set” by tightening it with full body weight. Once tied, for additional security each end should be tied in a double overhand stopper knot around the other standing end. Use long tails and tie an Overhand Knot in the tail of the Outer Strap. Use a Flat Overhand Bend instead. Even better, use a Flat Overhand Bend with an Additional Overhand Knot. Use another bend, e.g., an Alpine Butterfly, a Double Fisherman’s, or a Figure 8. The Munter Hitch can be used to belay or rappel if you lose your belay device. Seek out instruction on belaying and rappelling with the Munter hitch before attempting it by yourself. Hold the rope in both hands, and form a loop by crossing the rope over itself. Then form a second loop in the same way. Now fold the two loops toward each other like you’re closing a book and clip a locking carabiner through both loops. Also known as a Lark’s Foot Knot, a Cow Hitch and a Lanyard Knot. The Girth Hitch is an easy way to connect a loop of webbing or cord to a fixed point like a tree, or a climbing harness’s tie-in points. Here we show the hitch around a carabiner but the process is the same on any object. When completed, the Cow Hitch is identical in structure to the Lanyard or Girth Hitch. The difference is in how they are tied; the Cow Hitch is more practical with long rope where only one end is available, e.g. when the other end is tied to an animal. The Lanyard Hitch, on the other hand, requires threading the entire rope through the formed bight which makes it impractical for use with long rope. The Double Fisherman’s Knot is a very secure way to join two ropes or form a cord into a loop. It’s very difficult to untie after it gets weighted, so it’s a good choice for making Prussik loops. The Clove Hitch allows you to secure a rope in place on a carabiner. It’s easy to untie after taking a heavy load, and quickly unravels when you unclip it from the carabiner. Many climbers use it to connect directly to an anchor. You can tie a clove hitch with two hands or with one. Hold the rope in both hands, and form a loop by crossing the rope over itself. Then form a second loop in the same way. Now move the second loop behind the first, and clip both loops with a carabiner. Dress the hitch by pulling both strands tight. If you’re at the anchor, you can also tie the clove while you hold onto the anchor carabiner with one hand. Grab the rope in your fist with your finger pointing down the rope. Bring your hand up so that your finger points up and toward you. Then clip the rope into the carabiner. Now grab the rope below the carabiner and do the same thing again. Grab it with your finger pointing down, bring it up so that your finger points up and toward you, and clip it into the carabiner. Dress the hitch by pulling both strands tight. The Alpine Butterfly knot forms a loop in the middle of a rope and is especially useful for the middle member of a rope team because it won’t deform after a pull in either direction. The Sheet Bend is a useful knot for tying two ropes together, and is recommended for joining two ropes of unequal size. It is suitable for most non-critical applications. It is important that the tag (free) ends of both ropes of the sheet bend be on the same side of the finished knot. For more security use the doubled version (Becket Bend) which is the same as the single version but with an extra coil around the standing loop. The Sheet Bend also goes by the name of Weaver’s Knot when employed in yarn or twine. It is commonly used for joining threads that have parted in a loom or as a permanent knot tied in small material. Hold your hand so the fingers are one on top of the other with the thumb up, and hang the string over your first finger near the base of the thumb. Twist and bend your hand so your middle finger picks up the string behind your hand. Shake your hand downward so the string slides off your fingers (but don’t let go!). There, hanging in space, will be a loose overhand knot. This is a classic puzzle that has been around for at least 250 years. It is challenging, but it gives you a chance to get students up and moving.The solution depends on lateral thinking and topology or the mathematics of distortion. For this puzzle you need two people. Each person will need a piece of rope with a loop tied in both ends, so it can be worn as handcuffs. The rope should be reasonably long, so that the person wearing it can easily step over it if they want. 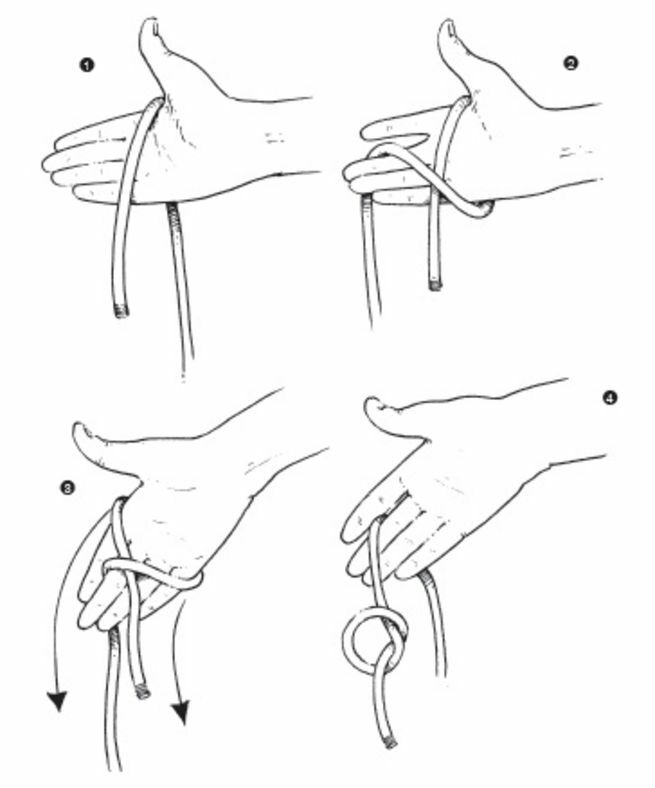 Put the loops on one person’s wrists, tighten the loops a little leaving some space between the rope and the wrists. Take the second rope loop it around the rope the first student is wearing and then put the loops on the second person’s wrists.and tighten the loops a bit. The handcuffs are now looped around each other so the people are tied together. They now have to find a way to separate themselves from each other while following these rules: The handcuffs cannot be removed from the wrists. You cannot break, cut, bite through or in any other way damage the rope. 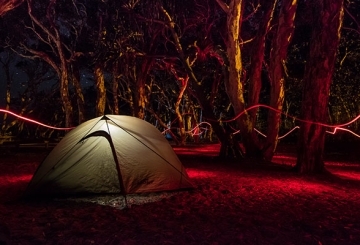 First, get a completely untangled rope. 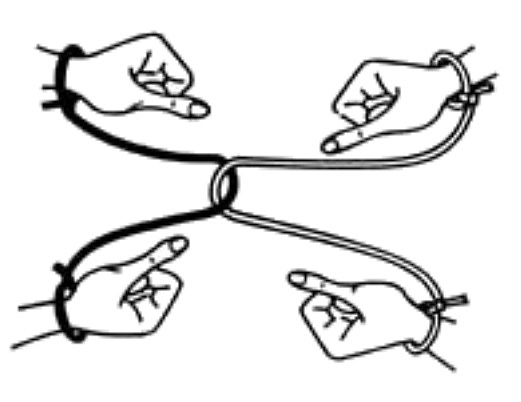 Now, your task is to grab its two ends, and without letting it go, tie this knot in the middle. In order to do this, first cross your arms, and from this position, grab the two ends of the rope. Once you untangle your arms, the knot will appear on the rope. In days gone by lifting a sack was a very common thing to have to do. When the sack has been opened, the Sack Lift Knot is the perfect knot for the job, as the “open sack” forms part of the knot as well as the rope. 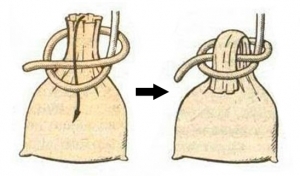 The Sack Lift Knot is particularly easy to tie and also untie, even when it has been under extreme load, and would be useful for suspending sacks for a period of item. The one disadvantage is that the knot becomes insecure when not under constant load. As soon as any weight is taken away from the knot is can easily become undone. Have an interesting knot or useful knotting resource to share?